I have written a lot on my blog about my experiences overseas and what you should expect when you visit some of the most beautiful and wonderful places in this world. However, it occurred to me that I have a lot to offer other travelers on what to expect when they visit my home country, the United States of America. In my travels, I have learned that there are a lot of misconceptions that people around the world have about Americans and a lot of things that people think about Americans that are pretty spot on. The United States is a very big and complex place, and it can be quite intimidating for someone to visit for the first time. In this article, I hope to dispel some of the more common misconceptions about visiting the United States, as well as provide you with some tips for how to prepare for your first visit state-side (that’s what we Americans call home). As always, if you have any thoughts or opinions on what travelers should know before visiting the United States for the first time, I would absolutely love to have you comment below. Any and all feedback is helpful for other travelers! However, please no political comments. I think the most common misconception that people have when they visit the United States for the first time is how big the United States really is. People will often visit the United States thinking that they can visit all of the places they want to see in a few weeks, only to discover how challenging that is when they arrive. Some travelers I have talked to don’t understand the logistics involved in visiting the East and West Coast of the United States, or areas in-between all in one trip. And that is just the continental United States. When you add in the states of Hawaii and Alaska, the United States is even more vast. To give you a sense of just how big the United States is, take a look at the overlay map I created below. The drive from New York City to Los Angeles in the United States is roughly 4,489km, while the drive from Madrid, Spain to Moscow, Russia is roughly 4,176km. If you want to drive from New York City to Los Angeles, you are looking at a 41-hour drive, not including breaks for gas, food, and sleep. Visiting both coasts of the United States in one trip is much more like visiting multiple countries in one trip. You are better-served booking flights from one region of the United States to the next unless you are planning to just visit one region at a time. My recommendation would be to visit just one or two regions of the United States in one trip. The United States can be broken up into five logical regions, which I detail for you in the map I included below. For example, if you are interested in visiting New York City, Washington DC, and Las Vegas, you can easily do this in one trip by visiting the Northeast United States with a flight to Las Vegas in the Southwest United States. However, if you are planning to visit New York City, Los Angeles, and Orlando Florida all within one trip, you are going to be spending a lot of time traveling during your trip. To help you out, I will be putting together some itineraries on how to visit some of the most popular tourist destinations in the United States. 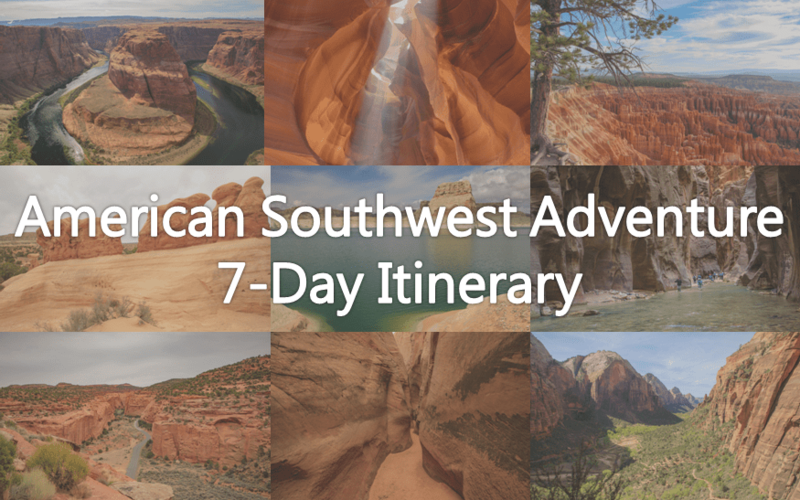 I have already written a 7-Day itinerary for visiting some popular national park lands in the American Southwest. I will be creating additional itineraries in the coming months to assist you in planning some fun, and feasible trips to the United States. So keep your eyes open for those! Another thing that people sometimes don’t realize when they visit the United States is just how diverse the United States really is. Because the United States is so big, there are different cultures, accents, and customs from region-to-region in the country. In fact, it has been reported that there may be as many as 11 different cultural areas within the continental United States alone that have their own distinct cultures and customs. When traveling to the United States, it may make sense to keep these cultural differences in mind while you are traveling. What is acceptable in the Northeast United States may not be acceptable in the South or the Midwest, and vice versa. Another thing that many people I talk to who are planning a visit the United States may not fully appreciate is the beauty of the national parks within the United States. Most people I talk to have plans to visit places like New York City, Disney World, Las Vegas, or Hollywood. Don’t get me wrong, those are all fantastic places to visit. However, seldom is it that I talk to someone abroad about visiting the United States who has plans to visit some of its national parks. The United States is the birthplace of the concept of national parks, with Yellowstone National Park being the world’s first national parkland. Since the establishment of Yellowstone National Park in 1872, fifty-seven additional national parks have been established in the United States. Each of these parks is fabulous in its own unique and beautiful way. From the desert landscapes in national parks like Saguaro NP, Arches NP, Canyonlands NP, and Zion NP, to mountain landscapes in parks like Rocky Mountain NP, Yosemite NP, and the Smoky Mountains NP, the landscapes in the US National Park System is as diverse as it is beautiful. There are parks that feature giant canyons, like the Grand Canyon NP, parks that feature giant trees, like Redwood NP, and parks that feature giant wetlands, like the Everglades NP. Whatever your interest, whether it be camping, hiking, star gazing, photography, or wildlife viewing, the US National Park System has something for everyone. So if you are planning a trip to the United States, make sure you check out one of its amazing national parks. If you aren’t familiar with the national parks in the United States, I have written extensively on them. In most cases, it isn’t very difficult to fit a visit to one of the national parks into most trips. For instance, Zion National Park is only a few hours away from Las Vegas. Anyone visiting Las Vegas would be missing out on seeing some of America’s most beautiful landscape by not working a visit into their trip. In many places in this world, it is possible to earn a living as a waiter or waitress without having to rely on tips. In the United States, this is a different story. Most wait staff and service staff in other industries as well earn a very meager wage for doing their job. Instead, they rely on tips from patrons to make ends meet. This is why tipping your service staff in the United States is so important. While a tip elsewhere may be a gesture reserved for only those who do a stellar job serving you, in the United States not leaving a tip is only reserved for those who do an absolutely awful job serving you. Now, I am not saying you are absolutely obligated to tip your wait staff in the United States. You aren’t at risk of getting arrested or verbally assaulted if you don’t. However, you should be aware of the message that you are sending if you don’t. If you don’t leave a tip, you are basically telling your waiter or waitress that they are absolutely horrible at their job. And believe me, they work very hard. In case you are wondering how much to tip for other services in the United States, I have put together a list below that you can use as a reference. Bartender: $1 per drink served or 15-20% of the tab. Coatroom Attendant: $1 per coat. Food Delivery Person: 10% of the bill. Skycap at Airport: $1-$2 per bag. Hotel Doorman: $1-$2 per bag or per person if hailing a cab. Hotel Bellhop: $1-$2 per bag. Hotel Housekeeper: $2-$5 per night. Hotel Concierge: $5 for getting tickets. No tip required for asking directions. If you haven’t visited the United States before, one thing that you will absolutely want to be aware of when you visit is that Americans strongly value their personal space. Americans typically don’t like to be crowded or have people sit or stand too close to them. If you don’t keep this in mind during your visit, you might find yourself in some awkward or uncomfortable situations. If you are boarding a bus or train and there are plenty of empty seats, make sure you take a seat that isn’t right next to someone else if you can avoid it. Likewise, if you are a male and you are entering a restroom and there are plenty of urinals available, make sure you use a stall that isn’t right next to someone else. If the only seat or stall is one next to someone else, that is fine, but if you have a choice the American custom is to choose the seat, stall, etc.. that isn’t right next to the one that is occupied. This concept also applies to other situations. If you are engaged in a conversation with someone, make sure you leave at least a few feet between yourself and others. If you get any closer you run the risk of making other people feel crowded and uncomfortable. You should also refrain from touching other people unless you know them well and are sure that they won’t be offended by it. This doesn’t apply to handshakes, which are part of American culture and are widely seen as acceptable. However, please keep in mind that just because Americans tend to value their personal space, that doesn’t mean that Americans are stand-offish. On the contrary, Americans tend to be overly engaging and friendly in their conversation. Don’t be surprised if a stranger asks you how you are doing or how your day is or ends a conversation with “see you later”. So, don’t be surprised if someone engages you while waiting in line, on a bus or train, or elsewhere in public. I have spoken to many travelers visiting America that are taken aback by the overly engaging tendencies of Americans. It’s a bit of a paradox in the sense that Americans can be overly engaging, but at the same time value their personal space so much and takes some getting used to for travelers visiting the United States for the first time. Gun violence in the United States gets a lot of media attention and the United States certainly has some issues with violence in certain areas of the country. I do not want to get into the politics of gun control or any other political topic in this article, but I do want to let visitors know that the United States is generally a very safe place to visit. In my 40+ years of the United States, I have never seen a gun in public and I have never felt unsafe when traveling throughout the United States. Obviously, there are areas of the country that you should be wary of, especially at night, like all places in this world. Furthermore, it always makes sense to keep your safety at the forefront of your mind when visiting any location. For some tips on how to stay safe when traveling, please refer to my Travel Safety Guide that I linked below. All that said, the United States was built by immigrants, is a country that is built on and embraces diversity, and has many warm and welcoming people who would love to show you hospitality. So if you are planning a trip to the United States, we are anxious to host you and show you our beautiful and diverse country! One tip that I can give you when visiting the United States that I cannot stress strongly enough is to avoid talking about politics or religion, especially those pertaining to the United States while visiting the country. If you asked me to name one way to quickly offend Americans, I would say interjecting your opinions into the politics and religious beliefs of the country would be by far the easiest way to do that. The same can be said for religion. Debates on religious extremism are hot topics in parts of the United States. Not only has the issue of terrorism and Muslim extremism been a hot-button topic in the United States since the terrorist attacks on September 11, 2001, but there are also Christian groups that practice extreme forms of Christianity in the United States as well. The most notorious is the Westboro Baptist Church in Kansas. They are most well known for protesting the funerals of American soldiers killed in military action because of the US Armed Forces policy of allowing LGBT individuals to participate in the Armed forces. The very vast majority of Americans will not judge you based on your politics or religion, and people of all political beliefs and religions are welcome as visitors in the United States. However, there are many Americans who will be offended by having their political or religious views challenged by visitors to this country. Unless you are speaking with someone that you know very well, it would be best to avoid talking about these subjects even if you are asked about them. If these topics come up in groups you are with, it would be best to just stay neutral or listen. These topics have gotten increasingly divisive over the past few decades and discussions even within families can include lots of animosities. One of the most noticeable differences between the United States and most other countries in this world is the fact that the United States does not use the Metric system. These differences are most notable when driving or looking at the weather forecast. Instead of measuring distance in meters and kilometers, Americans measure distance in feet and miles. Americans also use the Fahrenheit scale to measure temperature instead of the Celcius scale. Believe me, adjusting to these things can be as confusing to Americans traveling overseas as it is to visitors who are visiting the United States. It can be confusing, especially if you are forced to do some conversions on the fly. For that reason, make sure you have a good understanding of how to convert kilometers to miles and degrees Celcius to Fahrenheit. In case you don’t know, 1 Kilometer is equal to 0.621371192 Miles, which means 100 Kilometers is equivalent to roughly 62 miles. In regards to temperature, to convert a temperature in Celcius to Fahrenheit, you multiply the temperature by 1.8 and then add 32 degrees. For example, 24 degrees Celcius is equal to roughly 75 degrees Fahrenheit. In a pinch, we have included a temperature conversion calculator on the right sidebar of our site that you can use to convert temperatures in Fahrenheit to Celcius. Another thing that I frequently hear from people who are visiting the United States for the first time is how much bigger the food portions are than they are used to. This is something I have also noticed in my travels abroad. In the United States, we really do serve very large food portions at meals. You should keep this in mind when you go out to eat at a restaurant in the United States. I would suggest reading restaurant reviews, talking to your hotel concierge, or asking around before going out to eat at a restaurant. This way you will not only be able to determine which restaurants have the best food, but you can also get an idea as to how big the portions are before you visit. If the portions are really big, you can plan on sharing. One tip I can give you is that most restaurants will have a lunch portion for many of the items on their menu. This lunch portion is typically smaller than the larger dinner portion. If you are out to eat for lunch at a restaurant, I would suggest asking them if they server lunch portions. This can not only save you on wasted food but wasted money as well. When visiting the United States, it won’t take you long to notice that Americans are really serious about being on time for appointments. If there is one thing that Americans generally are not, it is cavalier about their time. On the contrary, Americans are typically very conscious about how they spend their time. Americans typically don’t like wasting time. It is important to keep this in mind when visiting the United States. If you have an appointment to meet someone, you will want to make sure that you are not only on-time, but you should plan on trying to be there a little bit early. Few things annoy Americans more than not being punctual and few things will endear you more to an American than being early to meet them. Another really good way to annoy Americans is to cut in line (or the queue as it is often referred to abroad) ahead of them. As I mentioned in the section on being punctual, Americans are very serious about how their time is managed and spent. Again, Americans typically don’t like wasting their time. If you cut in line, it will be seen as an affront to their personal time, and you will likely offend people. When in the United States, make sure you understand whether there is a line when waiting for tickets, waiting to order food, waiting to pay for items in a store or any other activity where others are involved. If there is a line, make sure you understand where the back of the line is and get in the back of the queue. If you have one person waiting in line while others use the restroom, do some other shopping, etc… that is generally acceptable. As long as you have someone that waits in line, no one will typically have an issue with others joining them in line later. I thought these were all excellent tips, Josh. You might want to mention that most Americans are not multi-lingual. Fantastic feedback Eilene!! I think that is important enough a point to add an update. Much appreciated and thank you! As a Yankee-southerner with British relatives and a few international friends, this article was fantastic! It really hit the button on our customs, and the fact that you basically help visitors plan their vacations to this country was so well thought out!